On February 5, Gov. Tom Wolf outlined his 2019-20 budget proposal that included major workforce development and education initiatives he said would build the strongest workforce in the nation. He proposed no increase in general taxes to support the General Fund budget. 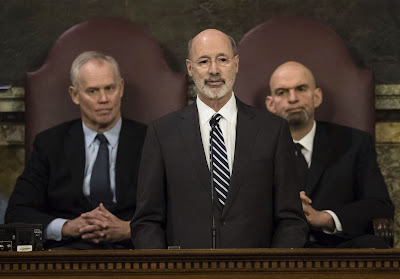 But he did propose a new natural gas severance tax last week to support his separate $4.5 billion Restore Pennsylvania proposal. Gov. Wolf budget proposes to take funds for the first time in significant amounts from the Environmental Stewardship (Growing Greener) Fund, the Keystone Recreation, Park and Conservation Fund and the Recycling Fund to support the general administrative costs of the departments of Environmental Protection and Conservation and Natural Resources and county conservation districts. The proposal would also transfer more money than in the current fiscal year from the Oil and Gas Lease Fund to support DCNR. At the same time, the proposal would reduce transfers from the Marcellus Legacy Fund supported by the Act 13 impact fee to the Environmental Stewardship Fund. A total of $95.7 million would be transferred to be used for administrative costs or not deposited in these special funds for their originally intended purpose. On the positive side of the ledger, the budget proposal would shift about $20 million in debt service payments from the Environmental Stewardship Fund to the General Fund (Personal Income Tax) to pay for Gov. Rendell’s Growing Greener 2 bond issue. The net loss to special funds available to DEP and DCNR would be about $75.7 million and will be recurring. The Administration's goal, however, is to keep about the same level of project support grants as they have in the past. The General Fund proposal announced today does not contain new initiatives to address key statewide environmental issues, except for a $3 million proposal in the Department of Agriculture to support farm conservation technical assistance. The net result of this proposal is to make the passage of Gov. Wolf’s $4.5 billion Restore Pennsylvania much more important to maintain the state’s support for community-based projects to restore watersheds, reduce the impacts of flooding and water quality impacts from stormwater, support conservation efforts by farmers, increase efforts to preserve open space, increase recreational opportunities and deal with the increasing backlog of maintenance and infrastructure replacement projects in State Parks and forests. It would transfer $20.1 million grom the Marcellus Fund to the Hazardous Sites Cleanup Program to keep that program operating as it has been. As a result of these transfers, General Fund support for DEP would decrease from $156 million to $135.1 million. In the 1994-95 budget, General Fund support for DEP was $165.6 million. Overall, DEP’s budget from all sources would increase from $725.996 million to $786.407 million. The staff complement at DEP would remain the same at 2,497 with about 2,300 filled positions. The total staff complement in 2002-03 was 3,200. The budget proposal would support DCNR administrative operations with a transfer of $30 million from the Keystone Recreation, Park and Conservation Fund and a $21 million increase in the monies transferred from the Oil and Gas Lease Fund from $48.6 million to $69.6 million. Other changes include $2.2 million for the Heritage Parks Program taken from Environmental Stewardship Fund. As a result, General Fund support for DCNR would decrease from $122.6 million to a proposed $85.2 million. Overall, DCNR’s budget from all sources would increase from $382.8 million to $391.1 million. The staff complement at DCNR would increase to 1,276 from 1,264 this year under the proposal. Overall the Department of Agriculture would see an increase in General Fund support to $163.2 million from $151.8 million. -- $2.9 million support for conservation district maintained. The staff complement at Agriculture would increase slightly to 588 from 586 this year.